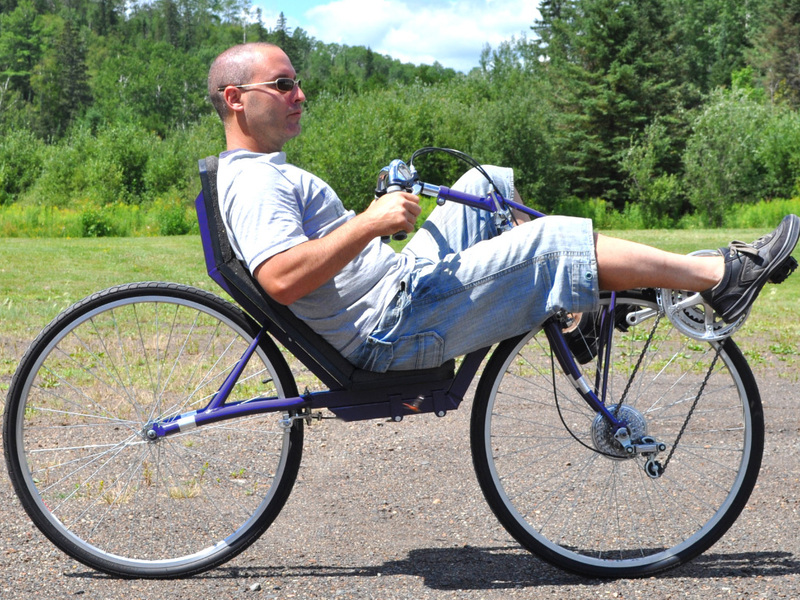 Build Your Own Front Wheel Drive Recumbent Bike. 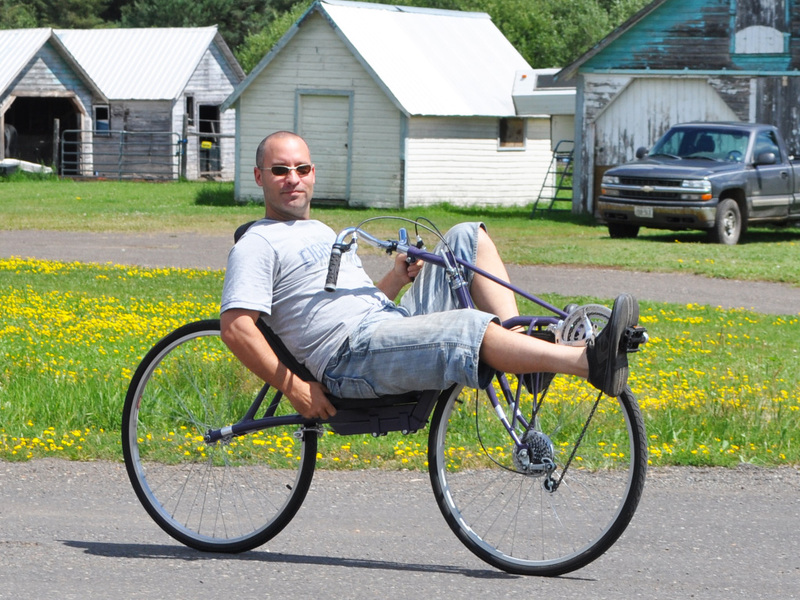 The FrontRunner DIY front wheel drive recumbent bike is a unique fwd bike that you can build using parts salvaged from a standard upright bicycle. This speedy recumbent bike is fully adjustable to riders of any leg length, and can even be folded in half for transportation or storage. The FrontRunner weighs the same as any ordinary bicycle and can have 18 or more speeds. Almost all of the components you require can be taken from a salvaged road or mountain bike. Most of the frame tubing is cut and reconfigured , so there is very little waste. The rest of the frame is made from common hardware store steel tubing. The FrontRunner front wheel drive can alter its wheelbase thanks to the easy to build adjustable frame boom, allowing more than 5 inches of adjustment for riders of varying leg lengths. 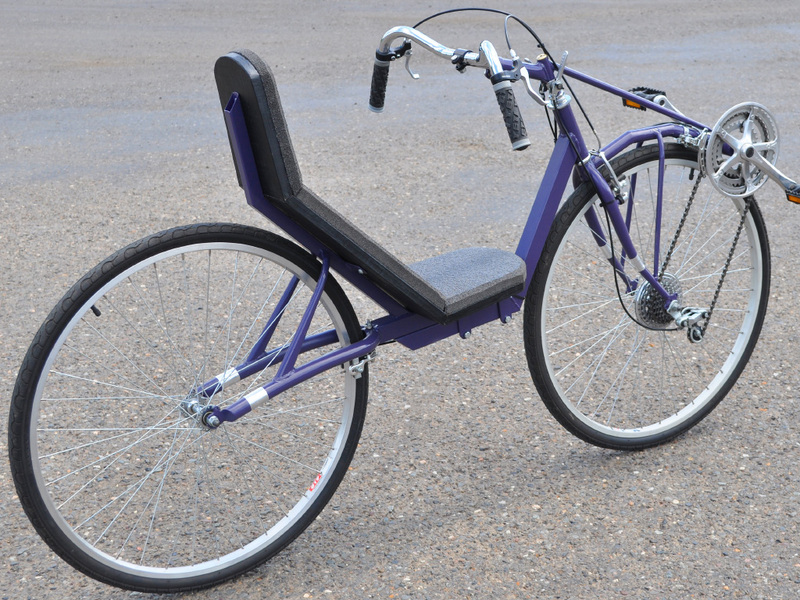 The handlebars are also fully adjustable, so that you can set up your recumbent bike for optimal comfort. With this easy adaptability, this DIY fwd bike will fit riders of any leg length with a few quick adjustments. If you have never modified or built a bike before, then this plan is a great way to start learning this amazing hobby. 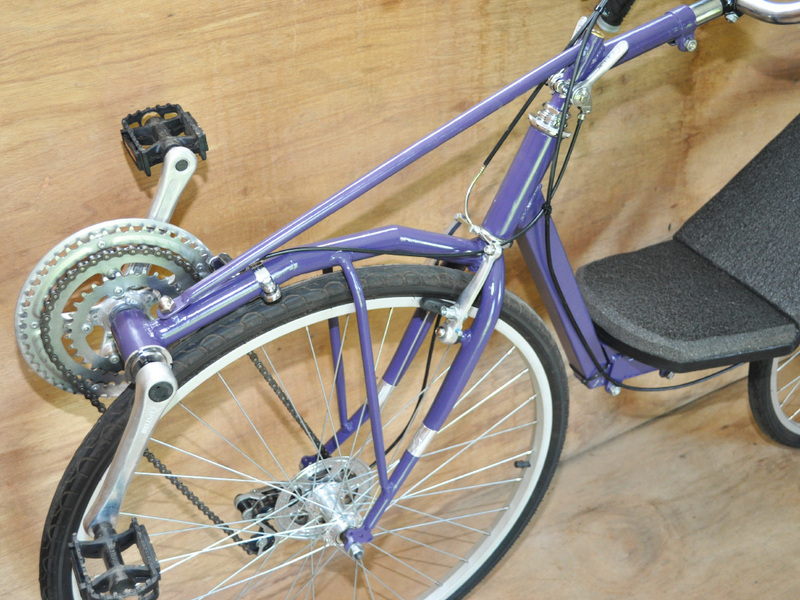 Learn to use bicycle components in creative ways, and build this and many other DIY bikes based on your new knowledge. An Efficient Transmission For Optimal Speeds. A recumbent bike allows you to push hard into the back of the seat in order to deliver your power to the cranks when you need it. Of course, the laid back and comfortable seating position also means that you can enjoy a leisurely cruise without having to hold up your head to see the road in front of you. Front Wheel Drive bike are also more challenging to ride, making them fun to ride and a great leg workout. This DIY FWD bike plan lays each step out in great detail, offering many places to make modifications to suit your needs or use the parts you already have on hand. You can make your FWD bike using any size frame and wheels as well from 20 inch, up to 26 inch. Recycle a Standard Bicycle Into Something New. All of the components used on the FrontRunner can be taken from a single working bicycle, so you can build your own DIY front wheel drive recumbent bike without having to hunt for parts. Even the frame is made of commonly available square tubing, so you can build the FrontRunner on a minimal budget. Besides a few feet of steel tubing, you are basically reconfiguring a standard bike into somehitng much more fun and unique. The unique adjustable length frame allows setting the cranks to the optimal position by simply adjusting two bolts. This split frame design opens up many other doors for your own customizations such as changeable rear ends, or even a trike rear with leanign wheels. Deliver Your Power Directly to The Front Wheel. Recumbent bikes offer a workout that isn’t possible to get on a standard bicycle, pushing your legs to the absolute limits when you feel like racing. 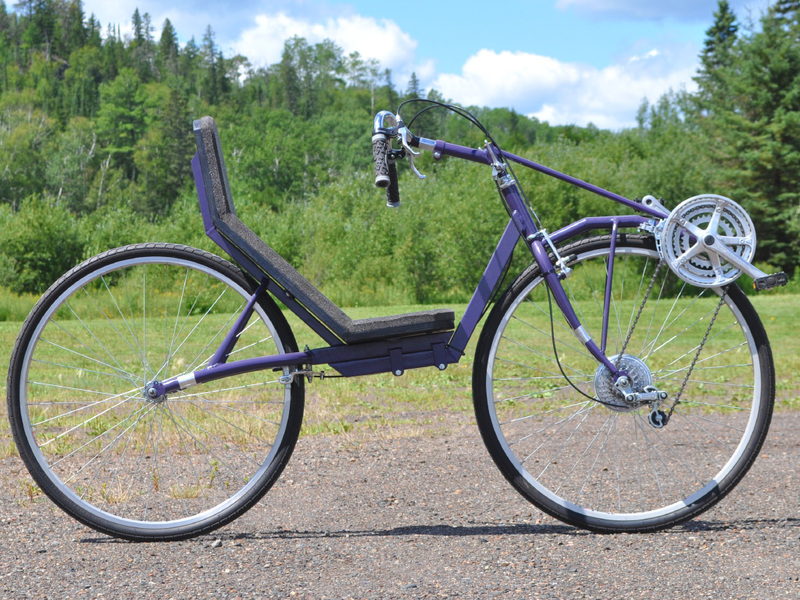 The FrontRunner DIY front wheel drive recumbent takes this one step further, offering an upper body workout as well since the steering system and transmission are mounted on the same part of the frame. Most of the speed records for human power were set using similar front wheel drive transmissions. Our plans take it one step at a time in great detail, explaining why things are done, and how you may want to change to suit your needs. you don't need any special tools, just a hand drill, grinder, and department store welder. Turn your old bike scrap into something amazing! Smooth Riding With Hifh Speed Cornering. Besides being comfortable, cool looking, and aerodynamic, a recumbent bike also allows the rider to keep on pedaling into even the sharpest of corners. Because the cranks are raised from the ground, there is no pedal strike while you are pedaling and turning simultaneously. Although it is just a bicycle, it certainly feels different than riding a road bike. Once you get the hang of it, you will enjoy a new level of speed and efficiency. All of the transmission and brake components are taken from an ordinary bicycle to be reused. Although all of these parts are repositioned, they do operate normally, so there is nothing new to learn about the controls. Add as many gears as you like. Good For City Riding or Long Distance Commuting. No matter how you ride, a recumbent seat is always going to be much more comfortable than an upright bike seat. With its full back support and generous padding, this seat will allow you to ride for hours without the usual bike seat pains. There is plenty of room under the seat to add some cargo carrying capacity or even a battery pack for a power assist motor option. With an electric assist hubmotor, your can flatten any hill with ease. The unique front wheel drive frame is a design that is easy to transfer to another DIY bike or trike, since it is fully self contained. The front triangle contains everything required for human power deleivery; drive, brakes, shifting, and steering. Everything About This DIY FWD Bike is Unique. 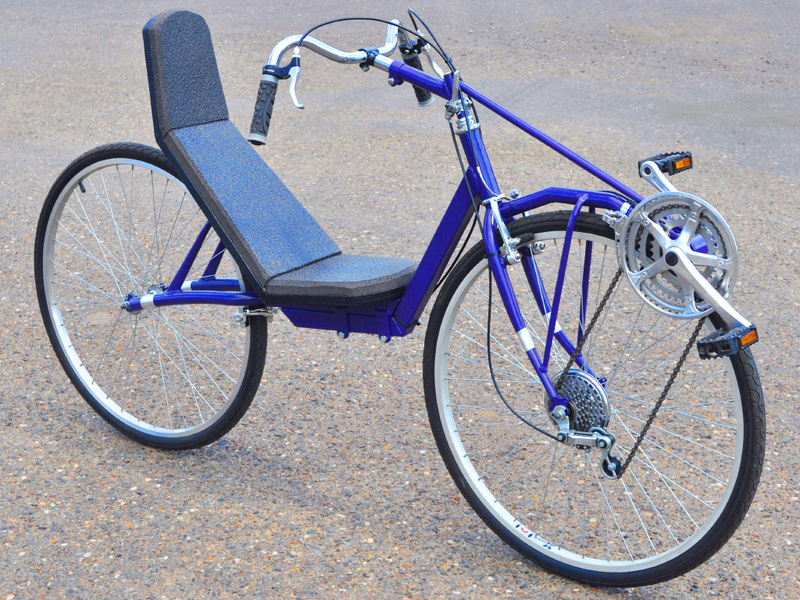 With direct drive front wheel transmission and an length morphing frame, this DIY recumbent bike is a very unique ride that you can add your own mods to. You can build your own speedy front wheel drive recumbent bike for a fraction of what a new bike would cost you. 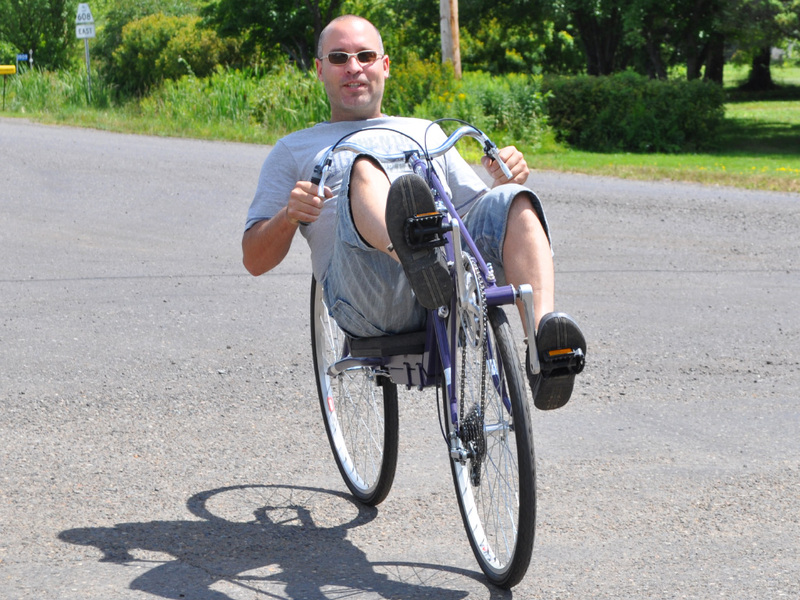 All you need is a parts bike, some steel tubing, and basic tools in order to create your own DIY front wheel drive recumbent bike. There is plenty of room to add your own modifications to our easy-to-follow DIY FWD bike plan, so you can create your own completely unique recumbent bike. 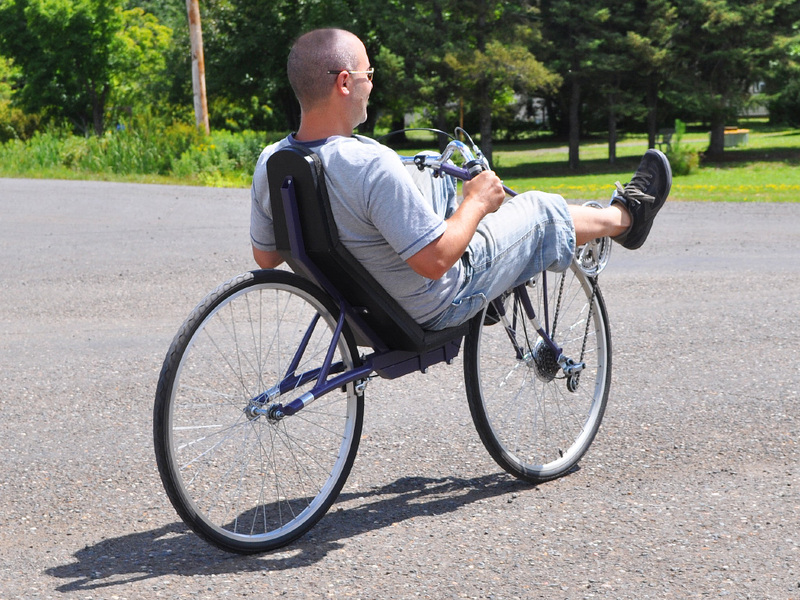 If you have been itching to try out a front wheel drive recumbent bike, then grab your tools and build it yourself!